Palermo feels like a place where schemes are hatched. Unexpected turns, the ancient beside the modern, the grit of daily struggle right in front of what feels like a limitless sea. In late 1943 it must have ten fold more fertile. Heavily bombed. Packed with American and British soldiers. Freshly free of Facism. German wartime photograph of July 1943 showing destruction in Palermo due to Allied bombing. 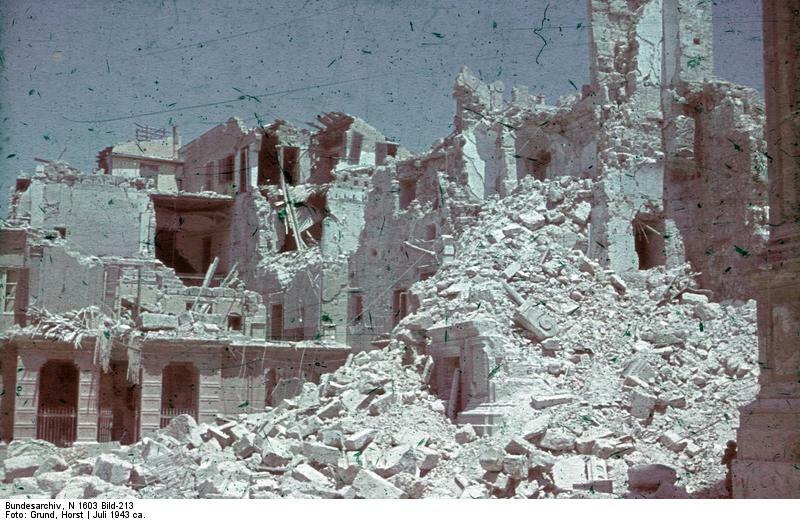 Allied troops entered the city on July 22, 1943.
Who could be here under those conditions and not have a crafty idea? 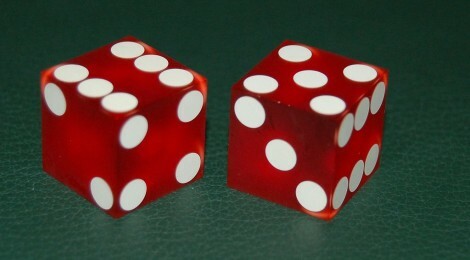 Let me be clear: I don’t think it was my father’s idea to be the house in a craps game. I suspect that idea is rightfully credited to Tony Mallone. A native Italian speaker in my dad’s unit, I suspect Tony took the temperature of the local populace and figured out the Palermitans were desperate for a distraction. The crafty idea my dad must have had here–and I am certain he must have built the idea within himself, as he trusted no one with money and detested get-rich-quick schemes–is that as the house, they would make money slowly and steadily. Beyond the basics–multiplication, addition, subtraction, and division–and the squares and roots needed for areas, my father was not a trained mathematician. Yet he had a head for figures. His first job away from the ranch was as a bookkeeper in a depression-era bank in Idaho Falls. He knew money from the inside. What he did for himself–and I feel in my bones that it was here in Palermo–was work out the combinatorics, the statics, of a craps game. Most people who gamble do so for the thrill; a few people who gamble have memorized the table of odds and play from memory; nearly none work out the odds for themselves and then build a business around it. Except the house. I remember him trying to teach me what he knew about combinatorics–What was I? Eight? Nine? What was I doing? Playing chutes and ladders? Had I graduated to Monopoly?–by taking dice, moving through each combination, and having me add the face values. Palermo is an invitation to put things together in new ways: Tony Mallone saw a need among the people. To fill the need he had to have a man who the players could trust, who didn’t scare easily, and who was scrupulously honest about money. How about that short cowboy? Doesn’t he have an honest face? I suspect they piloted their scheme here in Palermo: they weren’t here long enough to get into full swing. Naples is a place where little schemes can grow. What I know for certain is that they ran a craps game in Italy and that my Dad bought his first house–with cash, no loans, no banks, thank you–using his share of the proceeds of the game they ran in Naples. How did he get the cash from Italy to Idaho? Palermo is a place to generate schemes…and the scheme to move money over the ocean in 1944 and 1945 was one he never revealed, never tried to teach me. The secrets of the Postal Corps die with the Postmen. This entry used images from Wikimedia Commons. I, too, got the basic probability lecture at a young age. Along with why it was a bad idea to gamble if you weren’t prepared to lose. I am under the impression that most of the people playing the games were G.I.’s. They had money and time. I am also under the impression that the money came home in a duffle bag, although I don’t have any specific recollections of conversations that led me to believe that. Our duffle bags got sniffed for drugs when we came back from war. Oh, how the times change!